The use of agricultural insecticides — toxic substances developed to target and kill insects that damage crops — has sparked controversy since the dawn of the “chemical age”, which started in the 1950s. The benefits of agricultural insecticides — for example, increased food production — are undeniable. Unfortunately, along with benefits, there are considerable unwanted effects. Ideally, insecticides must be lethal to the target insects, but not to non-target species. However, these toxic substances do not target only insects — they target many more organisms, including man. Thus, the toxic brew of agricultural insecticides threatens the ecological integrity of aquatic and terrestrial ecosystems. Indeed, agricultural systems play a significant role in global environmental degradation — among other harmful effects, they drive the loss of aquatic biodiversity. In 2013, a team of researchers from German and Australian institutions showed that the loss of aquatic biodiversity in regions of Germany, France, and Australia, is primarily due to the disappearance of several groups of species — stoneflies, mayflies, caddisflies, and dragonflies — which are especially susceptible to insecticides. These insects are important members of the food chain right up to fish and birds. Despite these worrisome results, the degree of insecticide contamination worldwide was unknown until two weeks ago, when results from a new study (Agricultural insecticides threaten surface waters at the global scale) showed that surface water pollution resulting from the current use of agricultural insecticides constitutes an excessive threat to aquatic biodiversity. 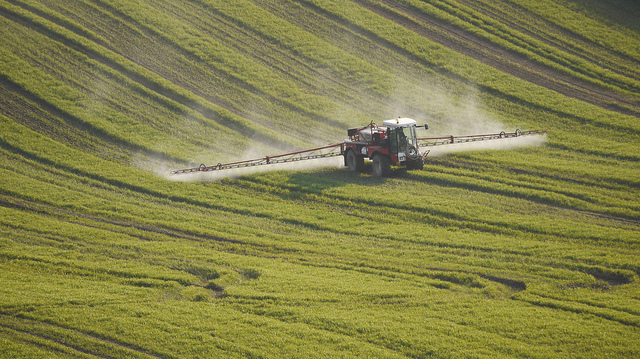 For the new study, researchers at the Institute for Environmental Science of the University of Koblenz-Landau evaluated, for the first time, comprehensive global insecticide contamination data for agricultural surface waters. They examined 838 studies conducted between 1962 and 2012 and covering 2,500 aquatic sites in 73 countries, using the legally-accepted regulatory threshold levels (RTLs) as defined during the official pesticide authorization procedures. The researchers found that insecticide contamination occurs rarely in the aquatic environment — only an estimated 2.6% of the samples contained measurable levels of insecticides. However, for the sites containing insecticides, the results were alarming — more than 40% of the water-phase samples, and more than 80% of sediment samples in which insecticides were detected, yielded concentrations that exceeded the respective RTLs. They concluded that insecticides pose substantial threats to the biodiversity of global agricultural surface waters and that the current regulatory risk assessment schemes and pesticide authorization procedures fail to protect the aquatic environment. It is likely that the global picture emerging from the study downplays the actual impact of insecticides. Indeed, according to the researchers, data on insecticide contamination could be retrieved for only about 10% of global agricultural surface waters — thus, at this time, there is no scientific knowledge on the extent of insecticide contamination of surface waters in large parts of the world, especially Russia and South America. Moreover, contamination of surface waters may occur at high concentrations only during a few days per year (short-term peaks) and, therefore, may go undetected. However, these short-term peak concentrations occur repeatedly and, due to the high toxicity of insecticides for aquatic organisms, lead to substantial and long-lasting adverse effects on aquatic communities. In addition, more than 80% of the samples analyzed for the presence of various pesticides contained more than one (and in some cases even up to 30) different pesticides. The resulting adverse effects of these pesticide mixtures could be substantially higher when compared to those of single compounds. These additive or synergistic effects are not considered in the current regulatory risk assessment procedures. What are possible ways to meet the twin challenges of providing sufficient food for a growing human population and reversing the adverse impacts of agricultural pesticides on global ecosystems such as surface waters? The researchers suggest fundamental reforms of the global conventional agricultural systems and the adoption of promising approaches from organic farming. With a large demand for crops in the world, pesticides have increased in use. But although the need for food has increased, the need for safe drinking water in developing countries (and California) is also present. I believe less toxic, more controllable pesticides should be produced for environmental and health reasons. Organic agriculture seem to be the safest answer to the pesticides issue. We should focus on researching ways to improve organic agriculture so that it produces sufficient food to feed the world’s population and ways of using natural pest controls on a larger scale instead of pesticides. The lack of data is more troubling than anything to me. It could possibly mean that we are underestimating the damage done to the ecosystem with insecticides.Pesticide is a necessary evil for food production to keep up with the growing population. I think first step in tackling this problem is funding research that studies creating more specific pesticides instead of just potent ones. An insecticide used widely throughout the world causing many adverse effects for humans and other animals is organophosphates. This chemical if consumed or inhaled, can cause severe neurological problems, reproductive issues, and death. Certain counties have decreased usage of this insecticide, however, it is still commonly used in underdeveloped countries. People using these insecticides that claim they are using them to produce more food to feed the masses are making excuses. There is more than enough food in the world to feed everybody. For example, we in the United States waste so much food by either letting it spoil or throwing it away especially in the restaurant industries. These insecticides are used to help promote and sustain the growth of more food, but majority of the food is sold to create profits for big businesses and interest groups. In developed countries such as the United States, there is high demand for excessive quantities of food to create quality/luxury meals. The opposite is true in underdeveloped countries because they suffer from a shortage of food and could careless about eating quality meals but rather having a sufficient /nutritious meal. The world considers “us” priority because we have the means to afford foods and other products. I believe that yes these insecticides are very harmful to nature and humans, but I strongly believe they are used more for profit than to fight word hunger. Often times it is more likely that issues such as the extinction of biodiversity due to pesticides are worsened before recommendations or even solutions to the problem can take fold. In the minds of the agriculturist, the use of pesticides is a means of protecting their income of such hard labor. Not only is feeding the masses a priority but protecting the crops is their means of survival. The U.S. Food and Drug Administration act as a ‘sieve’ for drugs that are approved for human consumption and in the same way there should a program that installs mediation methods for use of pesticides that limits hard to the environment and the biodiversity therein. The ecosystem is the most important aspect to any living organism. It provides a home for us and many other species. By not finding a proper means to help prevent intoxicating it we are killing it off. We should work on a means to use a bio friendly method of protection rather than insecticides. By using these toxins in our environment we are disrupting the food chain, which then leads to the deaths of species that weren’t even killed directly by insecticide run off, but by simply not being provided the food that was killed by the insecticide. This article hits home for me on many levels. Our main source of income 30 years ago was from commercial agricultural crop dusting which at the time we embraced. We are no longer directly involved in that market but do realize its significance with the move towards more urbanization and less self-reliance when it comes to feeding the masses. Fast forward 30 years and we now are raise honeybees. The use of any pesticides is of great concern to us since they are extremely devastating to these essential pollinators. Many colonies have been lost to pesticide use. So in addition to water contamination there are many other detrimental effects of broad pesticide use. As they say if the bullfrogs disappear thats the first sign that the environment is not healthy and out of kilter. From there it only propagates to include a whole range of species. Agricultural insecticides can greatly impact fish and birds because there is water contamination. The insecticides on the water surface can be a threat to the aquatic environment. Also the concentration of toxic chemicals will affect other animals, as they will be taking in the toxic chemicals. Pesticides will affect the ecosystem as aquatic biodiversity is decreasing. The contamination of surface water and toxicity levels will impact the biodiversity of organisms that live in the water. Even with highly specified pesticides, mass killing of insects still negatively impacts the ecological system by removing a nutrient source for other animals. Although that animal may not be poisoned directly, removal of a foundational piece can only weaken the entire system as a whole through a domino effect. If pesticides cannot be developed with higher specificity and their runoff cannot be controlled, it seems a feasible alternative would be further development and improvement of genetically modified crops which deter insects. Increased utilization of these GMOs could potentially lessen pesticide use, thereby preserving biodiversity. Undoubtedly, extensive research on existing and emerging GMOs would need to continue in order to ensure the safety of these crops for human consumption. I agree insecticides need to be developed with a higher specifity. Currently, you could liken them to a broad spectrum antibiotic with a low therapeutic index due to its toxicity. Although its killing the pathogen, just like these are killing insects, it is also killing your normal flora and slowly killing yourself, just like these are slowly killing other organisms. Alternatives such as GMOs do need to be utilized. Additionally, other natural alternatives are capable as well. Some vineyard owners swear by using ladybugs to prevent pests and I have read about the potential fungus to be grown on plants symbiotically, similar to mycorrhiza, and is able to repel pests. GMOs and natural alternatives need to continue to be researched. To achieve high agricultural productivity, negative impacts of pesticides should be minimize. The use of pesticides is not only affecting diversity, it is also resulting in climate change and many habitat loss. In addition, aquatic species and microorganisms in soil are also threatened by pesticides. It is obvious to think that human’s means of support (livelihoods) depend on ecosystem and biological resources. Survival of human being highly depends on survival of other biodiversity which depends on the ecosystem and resources. This cycle is continuous. There should be the best agricultural practices to rescue and reverse the decline of biodiversity and ecosystem to ensure the long term security. The food chain interconnects the biodiversity energy flow throughout each higher-level organism. Therefore, agricultural insecticides can serve as contaminating agents that have irreversible damaging ecosystem effects. A population surplus requires proactive sustainability, but natural organic sources epitomize continuity. Similarly, GMOs have promising goals, but ill-stricken effects should be noted.